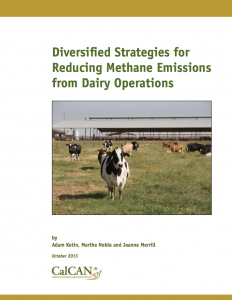 The methane emissions from California dairy industry can be reduced with alternative manure management practices. California is home to the country’s largest dairy industry, with 1,400 dairies and nearly 1.8 million cows. Half of the state’s agricultural emissions come from livestock in the form of methane, a greenhouse gas that is between 30 and 70 times more potent than carbon dioxide. In 2017, California launched the Alternative Manure Management Program (AMMP) to provide grants to dairy and other livestock producers to support their transition to manure handling and storage strategies that reduce methane emissions. Projects must include techniques to transition away from wet manure handling, which creates the anaerobic conditions that lead to methane production, to dry manure handling or pasture-based systems. In 2015, the state’s sole strategy for reducing methane was to subsidize the installation of anaerobic digesters to capture methane from dairy manure lagoons and convert it to renewable energy. However, for the majority of dairies, anaerobic digesters remain out of reach and are not compatible with their operations because of scale and economics. Digesters are expensive, costing between $2 million to $9 million to install, and there are concerns about their long term economic viability and environmental benefit. Most small and mid-scale operations do not produce enough manure to warrant the costs of installing a digester as they cannot maintain a digester full time and are unlikely to have the capital for such an investment. Moreover, Central Valley environmental justice groups raise significant concerns about the air and water quality impacts of digesters. CalCAN and others have advocated for a more diversified approach to manure management that is appropriate for a wider range of dairies and livestock operations. Those approaches include advanced solids separation, scrape systems, composted manure, compost pack barns and pasture-based strategies. Read more background on AMMP. CalCAN published a policy brief recommending ways the state can incentivize agricultural methane reduction strategies that make the wisest use of public dollars while maximizing environmental, economic, and public health benefits.